The Southwest Regional Conference, which consists of six local chapters in Texas, one in New Mexico, two in Oklahoma, two in Arkansas and two in Louisiana was held in Fort Worth this year at the magnificent Renaissance Worthington, a Fort Worth landmark hotel. The conference teed off on Thursday morning in Grapevine at Cowboys Golf Club, followed by a terrific opening party on the Plaza at Sundance Square. Mark Sheehan, Western Vice President of National Accounts and Field Marketing and I were in attendance and enjoyed an up and coming popular local band, great food and drink and networking with many Western customers, both new and old. After long and grueling educational sessions during the day on Friday, I had the pleasure of hosting a dinner with Henry Chamberlain (BOMA International President and COO), Dan Chancey (elected Secretary/Treasurer), Melissa Graham (elected President of BOMA Fort Worth and Vice President of the BOMA Southwest Region), Michelle Lynn (Association Executive of BOMA Fort Worth) and several other senior property management professionals from around the region. Following dinner, the group made the rounds to a number of “non-sanctioned” functions held at various Fort Worth watering holes. Fun was had by all! Western had the honor of sponsoring a very well attended educational session on Saturday morning featuring the ever popular and never politically correct Roger Jackson, a former U.S. Secret Service Agent who had the dubious distinction of serving three American Presidents. The event wrapped up on Saturday night with the prestigious TOBY (The Outstanding Building of the Year) Awards Dinner. Ironically, Fort Worth’s own Burnett Plaza stole the show by winning the most coveted category, which is the over 1,000,000 square feet TOBY. Under the Texas stars and perfect weather, over 300 attendees from around the region enjoyed Fort Worth hospitality. 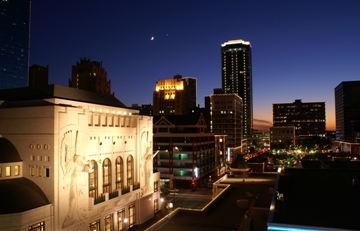 The 2015 conference will be in Tulsa, Oklahoma next April and Western will certainly be in attendance. Western is sponsoring a trade show booth at The BOMA International Conference, Expo and annual TOBY Awards Dinner to be held in Orlando, Florida on June 22nd – 24th. Dennis Ahrenhoersterbaeumer, Western VP of Field Marketing, Mike Noel, Southeast Regional Business Development Manager and I will be in attendance. Can anyone say, “We’re going to Disney World”?